In abalone fishing with spearing, size of abalone which was allowed to catch is strictly controlled in Japanese law. Therefore, fisherman usually judge size by observing from a boat. However, this is difficult, due to aging. Therefore, we have been developing an underwater robot to assist fisherman in determining abalone size by using a stereo camera. The robot is small size and uses 6 thrusters to achieve 5 DOF motion in an underwater environment. T. Ohba, “Culture of Abalone and Japanese,” Seizando-shoten publishing Co Ltd., 2004 (in Japanese). B. Borović and A. Vasilijević, “Potentials of Using Underwater Robotics for Fishing and Fish Farming,” Ognjen KULJAvCA2 Proc. of the 10th Int. workshop, 2011. J. R. Mart’inez-de Dios, C. Serna, and A. Ollero, “Computer vision and robotics techniques in fish farms,” Robotica, Vol.21, No.3, pp. 233-243, 2003. T. Maki, H. Kondo, T. Ura, Y. Nose, and T. Sakamaki, “Observation of Artificial Structures by Autonomous Underwater Vehicle,” J. of the Japan Society of Naval Architects and Ocean Engineers, Vol.1, pp. 17-26, 2005. S. Kamio, L. Canete, and T. Takahashi, “Development of a small and modular UROV for environmental surveying – Fundamental investigation of modeling and control system –,” The Society of instrument and control engineers tohoku chapter, 292th workshop, No.292-2, 2014. Y. Shi, W. Qian, W. Yan, and J. Li, “Adaptive Depth Control for Autonomous Underwater Vehicle Based on Feedforward Neural Networks,” Int. J. of Computer Science & Applications, Vol.4, Issue 3, pp. 107-118, 2007. 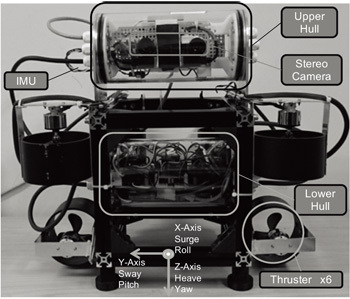 D. Maalouf, A. Chemori, and V. Creuze, “L1 Adaptive depth and pitch control of an underwater vehicle with real-time experiments,” Ocean Engineering, Vol.98, pp. 66-77, 2015. A. Agrawal, S. Ramalingam, Y. Taguchi, and V. Chari, “A Theory of Multi-Layer Flat Refractive Geometry,” Computer Vision and Pattern Recognition (CVPR), 2012 IEEE Conf., pp. 3346-3353, 2012. A. Sedlazeck and R. Koch, “Calibration of Housing Parameters for Underwater Stereo-Camera RigsBMVC 2011,” The 22nd British Machine Vision Conference, 2011. E. Trucco, “Introductionary Techniques for 3-D computer Vision,” Prentice Hall PTR Upper Saddle River, 1998. T. I. Fossen and S. I. Sagatun, “Adaptive control of nonlinear underwater robotic systems,” Modeling Identification and Control J., Vol.12, No.2, pp. 95-105, 1991.